Ever feel like diving into the deep world of jazz music and learning all that cool, sophisticated-sounding vocabulary? Have you felt a little odd playing popular standards or well known ballads with an inappropriate guitar? 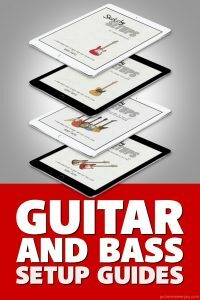 Although jazz has been played on most types of guitars, let’s take a look at what makes up traditional and modern jazz tones and which guitars can better help you achieve your creative vision. 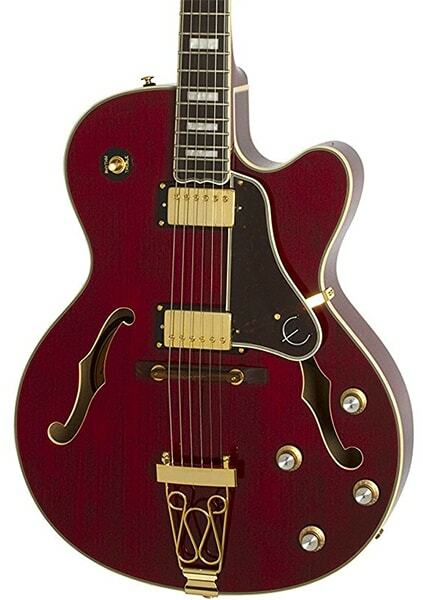 Traditionally, jazz guitar players have chosen the thick, creamy sounds of hollow body electrics. Being an older style of music, this is what was available in the 1930’s and gave an identity to the guitar in jazz ensembles. Gibson’s models were the most widespread offering long-established arch top construction and featured the woody sounds of straight bar pickups, then P-90s later, and eventually the famous PAF model pickups for rich and detailed expression. The use of flat wound strings and heavy string gauges added even more thickness and seemed to ease playing thanks to their smooth, flat wound surface. 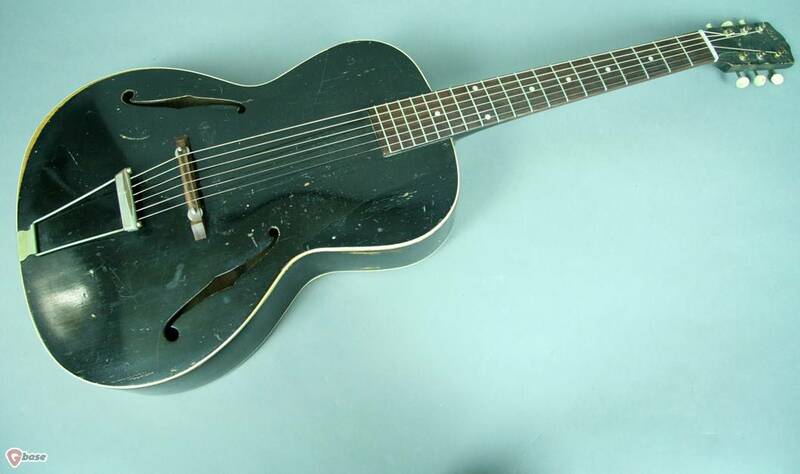 A 1930’s Gibson L-30 archtop. Image courtesy www.gbase.com. 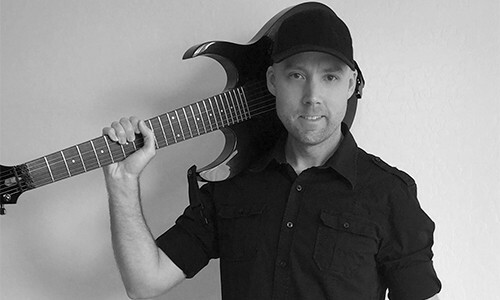 Stylistic changes encouraged guitarists to experiment with various instruments. 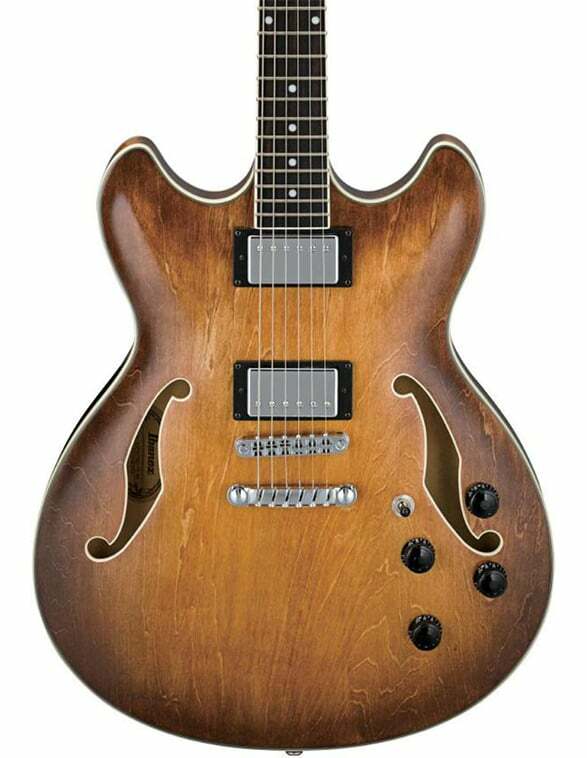 The hollow body addicts explored semi-hollow guitars that allowed a certain amount of overdrive to compliment their expressive playing and blues influences. While the more rock oriented axemen of the fusion style explored Les Pauls and various floating tremolo models. That creates a lot of variety to choose from, so let’s take a look at each category and discuss models in different price ranges to figure out the easiest way to hone in on your needs and preferences. This is the way to go if you want to play straight ahead jazz with a traditional approach to tone. The bigger these guitars are, the more enhanced the woody quality of the sound is, so take the time to try out different sizes. Different bridge types are also available. Wooden bridges provide a more authentic sound but are harder to adjust and intonate, especially when compared to their metal counterparts. These “jazz boxes” have a hard time handling higher volumes without resulting in feedback, so these models are, in a sense a one trick pony. 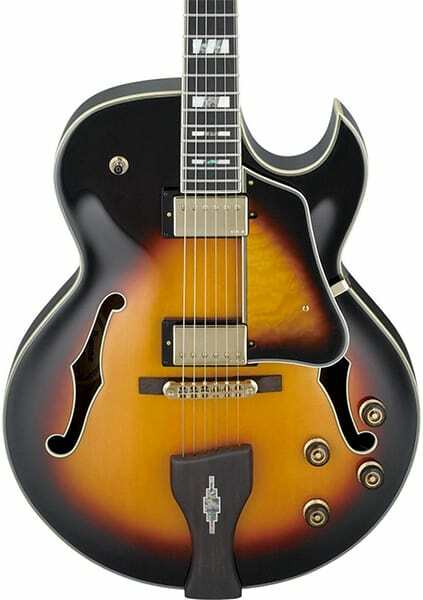 If price isn’t an issue, Gibson and Ibanez have interesting high end models, including signature models from legends such as Wes Montgomery, Tal Farlow, George Benson and Pat Metheny. 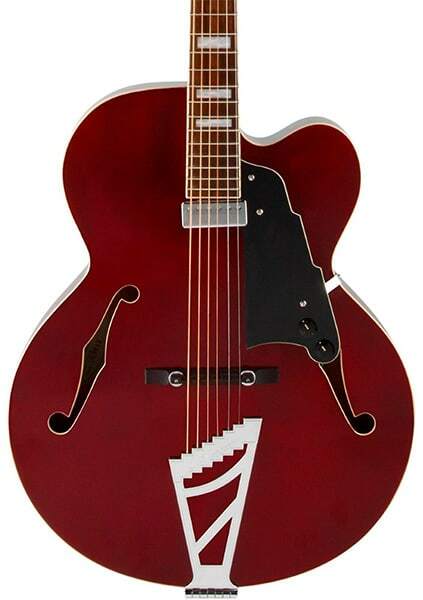 For more affordable models, Ibanez offers the Artcore line and Epiphone features the wonderful Joe Pass model with wooden bridge that will satisfy any bebop purist. 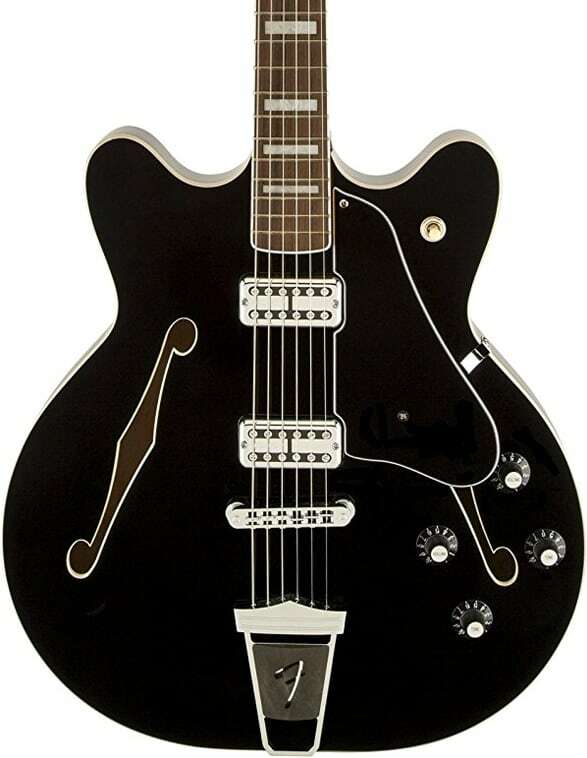 Semi-hollow body guitars offer the nice mellow tones of the fully hollow models, but with the added advantage of being able to handle additional volume and gain. With simple tone knob adjustments, the variety of tones available is quite varied and could interest guitarists looking for more versatility in their axes. From sweet jazzy tones to raunchy blues and rock, this category of guitars offers a lot of bang for your buck. Like the larger jazz boxes, different shapes and sizes are available, so it’s a good idea to try different models to see which ones fit more with your playing and your style. Other than the size and depth of the body, playability is similar to the completely hollow models. 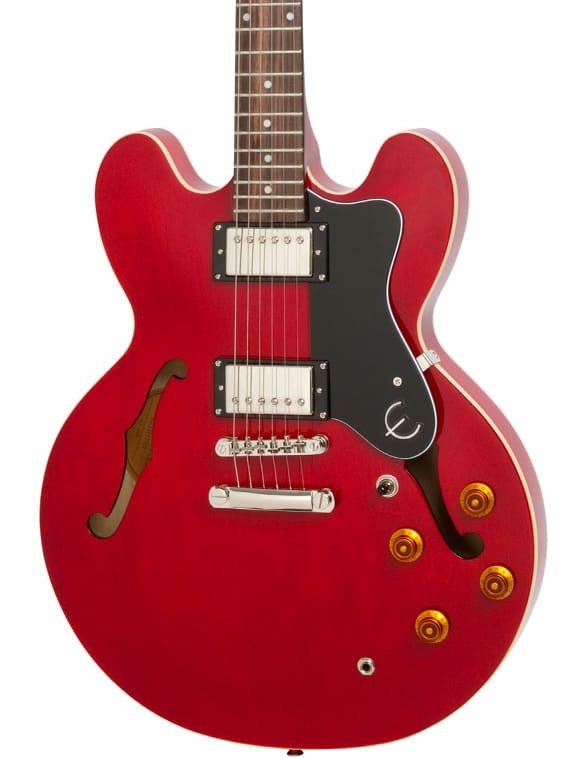 The Gibson ES-335 (pictured below) is the flagship model that sets the standard for other builders. The sophisticated playing of Larry Carlton really put it on the map and opened the eyes of other players towards what was possible within the jazz boundaries. Other players with very interesting and unique tones such as John Scofield, Kurt Rosenwinkel and Ben Monder use these types of guitars. Other than the f-hole models usually seen in jazz, the most often seen guitar in the genre is the Fender Telecaster. Usually a very bright sounding instrument, the amount of warmth available is very impressive when you start lowering the tone knob. 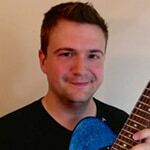 Although more modern players like Mike Stern, Adam Rogers, Julian Lage and the versatile Bill Frisell usually favor this type of model, more traditional players have had great careers with the Telecaster such as Ted Greene and Ed Bickert. In addition to being a great jazz axe, the Telecaster can double as a country machine, an awesome rock and roll tool, or an R&B favorite. This is a pretty big selling point for this seemingly simple guitar and I highly recommend checking out the various options offered at your local music store. For the fusion fans, there are several options depending on your preferences. If you prefer the likes of Scott Henderson, Wayne Krantz, or Oz Noy, a Stratocaster type guitar is really something to consider. With countless pickup and tremolo options, this is one versatile guitar that will satisfy many needs all the while offering expressive possibilities. Other more eclectic models come to mind when thinking of fusion. Allan Holdsworth’s Fat Boy made by Kiesel guitars (formerly Carvin) might be the most recognizable. This is a completely different beast, featuring a headless neck and optional floating bridge. Being a custom guitar, you can’t really try it out in stores and unless you know someone that has one, make sure that this sci-fi fusion model is what you really want. 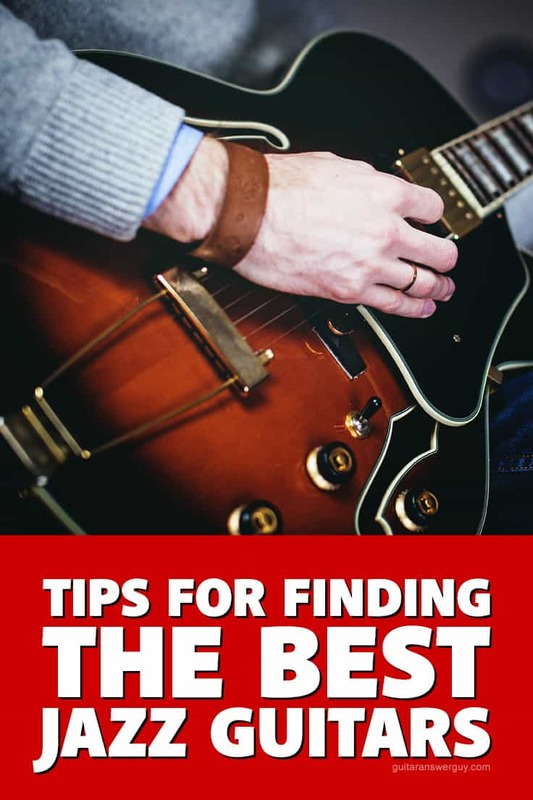 If this is your first jazz guitar purchase, I highly recommend you thoroughly explore the pros and cons of each of the categories I mentioned above so that you can get the most mileage out of whichever guitar you choose. If you can anticipate what style of jazz you’ll be most dedicated to, you most likely won’t get stuck with an axe that’s gathering dust in your practice space. Are you a jazz player? If so, what kind of guitar do you use? I’d love to know, so let me know in the “Leave a Reply” section down below! HI! I currently have a D’Anglieco Excel, which I string with LaBella 20PH strings. These are the very heaviest I am able to locate and I like them quite a bit. They offer nice, fat tone and seem to last forever (I only change them in January each year). I’m not able to play any gigs, but I do practice several hours each day. In the past, I have owned a Gibson ES5 Switchmaster, a Washburn J10 Orleans and several thin-body archtops. Cheers! I had to look up the LaBella 20PH strings, because I’m not familiar with them. Holy cow, those are some heavy strings! I bet they sound fantastic though. Yes, they sound great. I also use a stainless steel pick, which gives a nice, crisp attack. I plug into a Fishman Loudbox Artist – light-weight and has a nice, flat frequency response. My main guitar is a Gibson ES349 Custom – brilliant guitar with fabulous pickups. I’ve also the famous Epiphone Joe Pass, which is quite warm and mellow, but prone to feedback. Fender Telecaster (deluxe USA HH QMT) & Stratocaster (Jeff Beck custom shop strat as well as a USA deluxe with a maple fretboard), both of which can be expressively used to play jazz. Both USA deluxe guitars came equipped with S1 switch – so split coil allowing a wider range of tonality. I also play Ibanez PM120 (Pat Metheny), LGB30 (Little George Benson), Yamaha AES1500B, Yamaha AEX1500C (Martin Taylor model), Yamaha APX9C, Yamaha NCX700, Yamaha SA2200, Yamaha SF1000 some are more jazz orientated than others, being hollow or semi- hollow. I’ve also a Fender Jazzmaster and this is a superbly expressive vehicle with its wide ranging dynamics from its twin hum buckers. At the same time I’ve found my Vicente Sanchis Model Torres to be a blast, with a mellow tone, so good for classical, jazz and so on. Recently acquired a Taylor T5Z Custom and a Taylor T3B – both instruments are incredibly versatile and capable of being played in a range of genres. Holy cow Nick, that’s quite a collection! Thanks for all the good intel on some great guitars. Thanks for the feedback Dan! I’ll make sure Marc sees your comment, and maybe we can convince him to come back and write more for us on Jazz topics (admittedly, not my area of expertise) in the future.